Wyoming, the Cowboy State, isn't as dry as it looks, and its stream fishing isn't limited to big-name waters such as the North Platte, Laramie, and Snake rivers. In Wyoming's Wind River Range, peaks thrust 13,000 feet into the sky, and large trout fin placidly in remote lakes so clear they appear to be covered in nothing but cellophane. It's a region full of varied trout opportunities, from high mountain lakes to productive streams such as the Green, New Fork, Sweetwater, Popo Agie, and Wind rivers, which drain the flanks of some of America's most spectacular peaks. The excellent stream fishing, combined with exotic golden trout in the high lakes, makes the Wind River Range a sought-after destination for adventurous anglers. The Wind River Range is home to thousands of lakes and ponds, with an appealing mix of golden, brook, rainbow, and cutthroat trout. Best of all, nowhere else in the world do golden trout grow as big. Wyoming's record golden trout, which is also the current world record (an 11-pounder measuring 28 inches), was caught at Cook Lake in 1948. Several lakes in the Winds still produce goldens that reach or exceed the magical 5-pound mark. In contrast, California goldens typically measure between 6 and 14 inches in their native Sierra Nevada range. The Wind River area is the place to go for trophy golden trout, but it wasn't always that way. Wyoming's fly-fishing community owes thanks to Finis Mitchell. In the 1920s and 1930s, he used horses to pack milk crates filled with California goldens into the Wind River Range. Many lakes still hold descendants from his efforts. However, some lakes that traditionally had goldens no longer do. Until the early 1990s, lakes that could not support self-sustaining populations were stocked with goldens spawned at Wyoming's Surprise Lake. Then, in the late 1980s, major forest fires burned the Surprise Lake area. Due to many fire-related problems, goldens could no longer spawn successfully at the inlet and outlet areas of Surprise, and the Wyoming Game and Fish Department (WGFD) lost its source of golden trout. California has banned the export of goldens, and the fish haven't been stocked in the Winds since the early 1990s. Naturally reproducing golden trout populations are left to carry the weight of the Wind River fishery. Still, many Wind River lakes offer excellent fly-fishing opportunities for goldens, if (and this is key) you can pry their names from a respectable source, perhaps a biologist, tackle shop owner, commercial outfitter, or another trout addict. The WGFD and the U.S. Forest Service's Shoshone District office offer lists of lakes with goldens, leaving it up to you to put in only the sweat required to reach those lakes. One appealing option is to take a guided horseback trip into the Winds. There are numerous outfitters based in Pinedale, Dubois, and Lander. These trips offer easy access to remote lakes containing large fish. In addition, you may pack in more gear and food than you could carry in just a backpack. Typically, fly fishers divide the range into two sections, west and east. The west side has numerous golden trout lakes with trophy potential located off the main trails. These lakes see more pressure than the lakes on the east side, due to major trailheads leading in from the Green River Lakes, Big Sandy, and Elkhart Park areas. Pinedale is the epicenter for trips leading into the west side of the Wind River Range. The east side, from Dubois south to Lander and South Pass, is less accessible because of Wind River Indian Reservation regulations. The reservation wraps around a good portion of the central and eastern Winds, and to fish within it requires a tribal license. Access to trailheads over tribal lands requires hiring a tribal guide. The cost for travel to a trailhead varies, but expect to pay at least $100. Access over the reservation brings anglers close to prime golden trout lakes located in the Fitzpatrick Wilderness area, which has some of the largest goldens in the region. To reach the Fitzpatrick Wilderness from trailheads outside the reservation (the Glacier Trailhead near Dubois, for example) requires a 35- to 45-mile hike. Most reservation trailheads lie only 8 to 10 miles from productive golden trout lakes. Goldens often sulk in the depths, avoiding bright light. Frequently, they charge your flies, and then change their minds at the last instant. Sometimes they feed solely on plankton, ignoring your offerings altogether. When pursuing goldens, you must practice patience. July and August provide mostly favorable days, and the highest angling pressure. In years with heavy snow accumulation, some lakes remain inaccessible until late August or even September. During spring, goldens smack streamers, small nymphs, and egg imitations. By midsummer, the fish become picky and restrict their feeding to early and late in the day. During the fall, goldens feed heavily, packing on weight for the upcoming winter. There are scuds in many of the Wind River's golden lakes, and some of the best all-around patterns include the Rollover Scud and the Fast-sinking Scud (#14-18), which are particularly effective when you're throwing at visible fish. The Rollover Scud is so realistic even plankton-feeding goldens sometimes instinctively snap at it. Aquatic and terrestrial insect hatches are important when fishing high mountain lakes, so carry imitations of caddisflies, mayflies, midges, ants, beetles, and grasshoppers. My personal experience indicates that goldens love beetles. While specific match-the-hatch situations do occur, you most often search for goldens with attractor patterns. Excellent searching patterns include soft-hackled Woolly Worms (tied with a red or orange tag), Woolly Buggers, Crystal Buggers, Mohair Leeches, and Muddler Minnows in sizes 6 to 10. When fishing subsurface patterns, I use sinking lines. I carry a fast-sinking line, an intermediate line, and a slow-sinking "stealth" line. During my most recent foray to the Winds, I spent 14 days carrying a pack, checking out reports of lakes containing giant trout, searching for the new world record golden. The record was a fruitless pursuit, but I did catch and release beautiful goldens up to 14 inches long, with blood-red splashes on their flanks and bellies. I saw one fish that must have weighed more than 5 pounds but it boogied to deep water before I could throw a cast. In addition to goldens, I caught modest brook trout from numerous lakes and ate a few along the way. Every golden trout, regardless of size, should be released. The Winds also have lake trout, rainbows, cutthroat, and cuttbows up to 5 pounds. During my trips to the Winds I've landed 4-pound Yellowstone cutts in excess of 20 inches. From one off-trail lake, reported to be barren, I landed dozens of buttery cutthroat spanning between 16 and 23 inches. There wasn't another soul within miles, and the fish fed on beetles and mayfly nymphs without caution. It was the kind of fishing we all dream about: large and hungry trout in a beautiful high mountain lake setting. I looked to the sky and thanked the pilot who delivered those fish. Green River. For geographic purposes, the Green River's journey through Wind River country begins at Green River Lakes at the base of Square Top Mountain and flows first northwest, then straight south for 60 miles. The upper section ends near Pinedale. During late April, May, and June the Green River may be blown out. As it drops into shape later in June, look for caddis and Golden Stonefly hatches. Yellow Sallies, Gray Drakes, Pale Morning Duns, Tricos, and terrestrials such as ants, beetles, grasshoppers, and cicadas begin in July and extend through September. Baetis mayflies pick up the slack in November. The upper Green has ample public access, including a couple of all-day drift options. Average trout range between 10 and 16 inches, but some fish, especially browns, occasionally exceed the 20-inch mark. A variety of riffles, deep pools, rock gardens, and cutbanks define the Green's upper reaches. There are campgrounds on National Forest and Bureau of Land Management (BLM) lands adjacent to the river. New Fork River. One of the lesser-known prime trout waters in the West, the New Fork flows off the west side of the Wind River Range north of Pinedale and twists south through arid sagebrush desert toward its eventual confluence with the Green. Unfortunately, the New Fork flows almost entirely through private lands, and the only way to gain access to the stream is by floating it in a canoe, drift boat, or raft. Even while floating, you are restricted by Wyoming's water rights law, which prohibits dropping an anchor or placing a wading boot on the stream bottom. When fishing the New Fork you cast from the boat and you don't stop. But there's reason to deal with the hassle: the New Fork is full of browns, rainbows, and cuttbows. Fly fishers land large browns each season, but more are lost to the abundant brushpiles, logjams, and undercut banks. The New Fork is a true freestone stream and it acts accordingly. During late April, May, and June it blows out. Runoff subsides by late June or early July, just as the productive summer hatches begin. Through July, August, and September, be prepared to match Gray Drakes, Pale Morning Duns, various caddisfly species, Yellow Sallies, terrestrials, and Tricos. The Trico spinner fall is particularly productive on the New Fork on calm August and September mornings. You often encounter dozens of rise rings as you round a bend and drift through one of the New Fork's long flatwater stretches. Fishing the river's Trico spinner fall means wary trout, 5X or 6X tippets, diminutive flies (#18-24), and stealthy casts. There are several productive floats on the New Fork. One of the best begins south of Pinedale off of Country Road 123 at the Pinedale-Tyler Street access. From there it's about a 15-mile, all-day float downstream to the Boulder Bridge fishing access site. Another prime float is from the Boulder Bridge access downstream 10 miles, through a series of narrow channels, to the East Fork access. Fifteen miles downstream from Boulder Bridge is the Gas Wells public access site off County Road 23-106. An additional drift takes anglers from the Gas Wells downstream 5 miles to a BLM campground, where boat access is available. The campground is a nice place to overnight. A final option is to drift from the BLM campground downstream to Olson Bridge, 3 miles upstream from the New Fork's confluence with the Green. This lowest stretch has plenty of flatwater and technical match-the-hatch fishing. Before floating the New Fork, check with local shops regarding any river obstructions or other pertinent information. For a map of access sites, see mountainman country.com/activities/summer-recre ation/RiverAccess.pdf. While it may seem like a hassle to fish the New Fork, it is a wonderful Western stream with little fishing pressure compared to other rivers of similar quality. If you're looking for brown trout, this is the place to go. The river's biggest browns are often taken on large (#2-6) Muddlers, sculpin imitations, Zonkers, and Woolly Buggers. Fall-run brown trout, which move upstream from Fontenelle Reservoir and the Green River, enter the New Fork in September and October. Some of the largest browns of the year are taken in autumn. Duck Creek. This spring creek tributary of the New Fork is located just west of Pinedale off U.S. 191. Brown trout are abundant in this meadow stream, but they are not easy to fool. Bring your stealth, patience, precise dry-fly imitations, and 6X tippet for trout ranging from 16 to 20 inches or more. Sweetwater River. 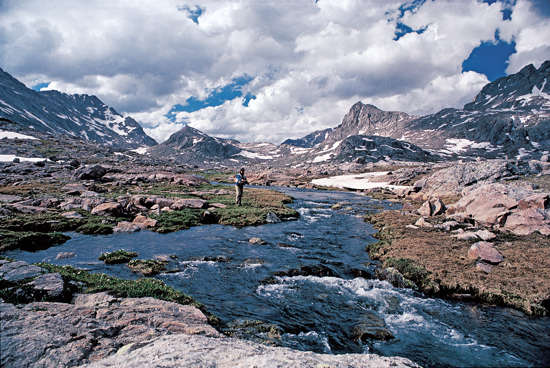 This stream drains the Wind River Range south of South Pass and the town of Lander, offering brown and rainbow trout in surprising numbers and sizes. The Sweetwater begins as a small stream that flows between the rolling sagebrush hills sweeping off the southern Winds. It follows an eastward course—beside wagon ruts from the Oregon Tail, the Mormon Pioneer Trail, and the Pony Express Trail—into the Red Desert southeast of Lander. It gains a little size through its course, but remains a small stream serving as a blue, cottonwood-lined oasis in a dusty, arid landscape. Much of the upper river winds through BLM land and has excellent access. The middle reaches, including a canyon stretch downstream of Highway 287, pass through a mix of private and public lands which can be difficult to access. The Nature Conservancy holds title to 6 miles of the Sweetwater winding through the Red Desert. Gain permission to fish the stream through the Nature Conservancy office in Lander, at (307) 332-2971. All along the river, brown and rainbow trout range between 14 and 18 inches. They rise eagerly for Pale Morning Duns, Baetis, terrestrials, and especially caddis. LaFontaine's Emergent Sparkle Pupa, Elk-hair Caddis, and Prince Nymphs (#12-16) draw strikes in late June and throughout July. Terrestrials work best in August, September, and October, when hopper patterns draw takes. Foam beetles and Shroeder's Parachute Ants work well, too. The Sweetwater is best fished on foot, although enterprising anglers occasionally float the stream. During late summer months, the river can resemble a trickle and it warms to temperatures lethal to trout. In these conditions, forgo the Sweetwater and focus on larger streams or the highcountry lakes. Popo Agie River. An angler's first challenge with this stream is pronouncing its name correctly. This small stream, which flows out of the Wind River Range, through the town of Lander, and across the desert before joining the Wind River, has two productive forks and has rainbow and brown trout to several pounds. Insect emergences include PMDs, Baetis, caddis, Yellow Sallies, and terrestrials. The Popo Agie fishes best during spring (prior to runoff) and during late June and July as runoff subsides. By August and September, the river's Middle and North forks are prone to low flows, and the trout become incredibly wary and selective, but they still rise for terrestrials and basic mayfly and caddisfly imitations through August, September, and October. During the fall, browns run upstream from distant Boysen Reservoir and the Wind River. These fish can top 5 pounds and are fond of streamers, Glo-Bugs, and Egg-sucking Leeches. Portions of the North Popo Agie flow through the Wind River Indian Reservation. You must have a tribal fishing permit to fish these waters. Wind River. The Wind River begins in the spectacular Absaroka mountains near Togwotee Pass and the northern edge of the Wind River Range, just northwest of Dubois. It has excellent small-stream fishing for brookies, rainbows, cutthroat, and brown trout. The upper Wind has trout in the 10- to 16-inch range in a beautifully mixed landscape of rolling sagebrush hills, timbered uplands, painted red rock walls, arid badlands, and a lush, cottonwood-laced river corridor. The Wind's upper 30 miles—above the Wind River Indian Reservation—can be fished with a general Wyoming fishing license. Comparable fishing opportunities are available on the reservation, but farther downstream the river becomes increasingly prone to low water due to irrigation demands. Upstream of the reservation, access to this freestone river is generous, with several state-run fishing access sites and the adjacent Shoshone National Forest. There is excellent fishing for small brook trout upstream of Dubois. Downstream, brown, cutthroat, and rainbow trout take over, especially below the entrance of Jakey's Fork, a tributary that's worth exploring. The best fishing is during spring, prior to runoff, and again after runoff, in late June or early July. Caddis and stoneflies are available prior to runoff. PMDs, Tricos, Yellow Sallies, and larger stoneflies show during July. Terrestrial imitations catch fish in August, September, and October. When you get right down to it, Wind River country offers an amazing variety of fishing options for adventurous anglers. Always, I will think of the region first and foremost for its solitude, countless high mountain lakes, and the largest golden trout in the world. But it would be foolish to ignore its stream-fishing opportunities. Less pressured than comparable waters in Idaho, Montana, Colorado, and Utah, the trout streams in Wyoming's Wind River country offer what most of us desire these days—a little piece of fly-fishing heaven minus the angling hordes. Greg Thomas owns the web site Angler's Tonic and lives in Missoula, Montana with his daughters, Myka and Tate.